Should police have access to drivers’ sat nav data? TomTom last week admitted that the Dutch police had access to its customers’ sat nav data. And though it wasn’t aware that this was used to set speed traps, should the police have its hands on our GPS data at all? Just when you thought the whole online privacy and tracking issue was coming under some sort of control, along comes a story to stop you in your tracks. Sat nav company TomTom was last week forced onto the defensive when a Dutch newspaper revealed that its customer-generated GPS data had been used by the Dutch police to set speed traps in order to catch speeding motorists. Now, I’m reading between the lines here, but it appears as though Goddijn is saying that TomTom sells its travel time data to help governments and local authorities identify black spots, reduce congestion and improve road safety. Isn’t that a laudable goal? He also says that the company was unaware that the Dutch police used this data to put up speed cameras and set speed traps. And, thankfully, it ‘will make sure that this type of information is no longer used for this particular application’. So, what do you think? Are you persuaded by Goddijn’s quite impassioned response, or will you stop using your TomTom and switch to a brand that hasn’t let its driver data fall into the hands of the police? Perhaps even the British police have used TomTom’s data in the same way? The firm says that it can’t guarantee that the Dutch police was the only police force to do so. And let’s face it, with speed cameras in this country routinely snapping motorists for some misdemeanour or other, it wouldn’t surprise me in the slightest. It doesn’t surprise me that this data is being used in this way. I’m only surprised that this information isn’t already being used in the UK – or is it? I don’t care how many assurances the government gives us you cannot trust politicians with our information. The temptation is too strong for them to resist trying to control us or tax us even more than we are now.One only has to remember all of the promises that have been broken in just the last decade to know how untrustworthy politicians are! Remember how the Labour Government tried to “sell” I D cards! Don’t by Tom Tom!! You don’t have to share this information – so just don’t! As far as I’m concerned – All methods to monitor and help reduce speeding are to be encouraged – too many people speed. Though removing the 1 million uninsured drivers from the road permanently is more important.. The point here is “sells”. If TomTom “gave” the information to police to perform a morally laudible goal then there wouldn’t be an issue. However this proves that all technology does is give the providers another product to sell, data. I worked at TomTom and Goddijn is a politician, so you have to take his “impassioned response” with a pinch of salt as he is trying not to lose face and customers. In Holland the surreptitious way that the dutch go about policing speed is seen an invasion of their human rights. There are many dutch websites showing how to destroy a Gatso and where the radar hotspots are. Some dutch folk actually find the police and then drive back down the motorway and put a huge RADAR sign to let people know. This is not against the law. The dutch are very protective over their rights and privacy and I trust them to fully take TomTom to the cleaners with this one. Hi Dean, great to hear your views on this. It’s worth pointing out that TomTom’s anonymous customer data was sold to the Dutch government who then either sold it on or made it available to the Dutch police. The police then used the data to set up the traps. Would that distinction appease your point? Not really, because they “sold” it to the Dutch government in the first place. In other words, making a profit from a non-retail product that isn’t theirs to sell. Yes you can turn it off, as I always did, but let’s say you have TomTom HD traffic or Fuel Prices. You have to have data flowing both ways for that to work and so effectively you pay for the device, then the monthly subscription. Then they sell your usage data. 3 revenue streams in 1 product! In all honesty, you don’t know who they sell your data to, in the same way that you don’t know who your facebook and LinkedIn data gets sold to. Besides, why did the Dutch government buy it in the first place? You did say that you were reading between the lines, but ultimately, traffic data has been publicly available for years. I agree with the comment posted above by “richard”. Anything to stop people speeding can only be for everyone’s benefit. Let’s face it, the enforcement of speed limits in the UK is currently a great big politically correct joke. Brightly painted cameras, camera vans with big stripey panels, police in hi-vis jackets. What nonsense! In France, speed traps are hidden and radar detectors in cars are illegal and, guess what, you won’t see too many people speeding on the autoroutes. If you think some of the speed limits in this country are ridculously low (and I do) then write to your MP; don’t encourage people to break the law. I have a TomTom satnav & can’t understand the fuss, The data is anonymous and to use it to site speed cameras or whatever in places where more drivers are exceeding limits seems a good idea to me. TomTom also provide drivers with speed camera data so they can avoid getting caught! I’m no lover of TomTom as a company since they sell so called pan European satnavs with insufficient memory (2gb) to actually accommodate a map of Europe and in this instance I think their CEO is simply pandering to the knee jerk reactions of people who don’t like governments trying to do their job properly. Just seen this. I’ve a Go1005 Live. Totally distraught to have found this article. Totally against use of data in such a way. Disgusted with Tomtom. Thier products are Camel Dung in Beta stage at best. Only once in 18 months has a Tomtom worked out a route correctly but uncountably wrong so many times (I had a 950 previously). Software issues all the time at Tomtom on “My Tomtom” website home. Camera information so out of date it’s pointless, it’s not even same as thier suppliers database (Road Angel Group) only 1 update since November last year. Maps lack information on areas & roads built over 4 years ago, (They own Teleatlas by the way). They deserve to go out of business. I feel total hatred now for them having read about sale of data. No, I am not a speeding freak on the roads, keep it for a real race track. I think most of the commenters so far may be missing the point as to why Tom-Tom’s behaviour is either objectionable – or not objectionable – in selling data to the police. Consider first, precisely what the data is that Tom-Tom are selling to the Dutch government. It is the speed profile of a group of drivers on a particular road, probably indexed to time slots during a 24 hour period, and to the day of the week. By “speed profile” I mean that they get the number of drivers doing between 0 and 10 kph, the number doing between 10 and 20 kph, the number doing between 20 and 30kph, and so on. The exact speeds that define each “bin” may of course differ from those I have suggested, i.e. it might be 0-5, 5-10, 15-20, etc or something else. So if the speed limit on a particular road at location x is say, 40kph, they government find out what percentage of all drivers are doing less than 40kph, and what percentage are doing more than 40kph, i.e. exceeding the speed limit. They can probably also work out what percentage are exceeding it slightly (e.g. 40 – 50kph) and what percentage are really belting along as though there were no limit at all (e.g. >50kph). They will probably also know what day of the week and what time of day the speed limit is likely to be broken on a large scale. Clearly, this information is very handy indeed for deciding whether to put a speed camera at a particular spot, if your aim is to maximise the income you get from speeding fines. Putting in a camera will cost z euros. You should be able to work out (very roughly perhaps) how many months of fines you will need to recoup your outlay of z euros. This is just what the police would need to justify the expenditure on a speed camera to the beancounters who control the purse strings. They will probably also be able to factor into their calculations the effect of just putting a speed camera at location x will have on the behaviour of drivers. Many drivers automatically slow down as soon as they are aware of a camera – for obvious reasons – and if they do so, the police are denied the fine they would have otherwise imposed on those drivers. So they will get less income than if speeding motorists were entirely unaware of the camera. So far so good. But there is a snag here which is not immediately obvious. And that is that from the data Tom-Tom provides it is impossible to tell whether the group of speeding drivers contains just one individual or lots of individuals. And they can’t tell that because Tom-Tom aggregates the data (I am of course taking what Tom-Tom claim at face value – and it may be that Tom-Tom know perfectly well how many drivers are involved). 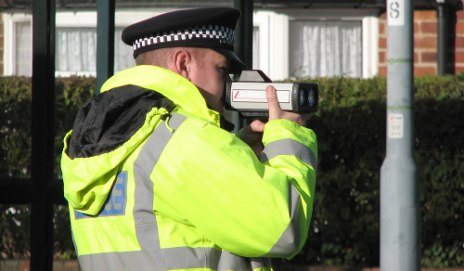 And if its just one driver involved in speeding on lots of different occasions, then its unlikely the police can fine him/her for each speeding incident – so again their income may be a lot less than first thought. Some of us might maintain that slowing down speeding drivers is a “good thing”, regardless of the amount of money that has to be spend to do it – i.e. they don’t care whether the camera pays its way. The beancounters probably won’t agree with them, of course. Clearly in countries like Holland and the UK, the income from a proposed camera will be a lot lower because of this effect of its mere presernce on driver behaviour. In a country like France, where apparently the cameras are entirely hidden and undetectable by any driver, fines will be collected like they are going out of fashion. Obviously word will get around, sooner or later, at least in the local community, that there is a speed camera at location x, and eventually this will have some effect on the behaviour of local drivers in the know. So, we might ask ourselves now whether this it is legitimate for Tom-Tom to sell data that we (the drivers) have generated to governments, or government agencies like the police? At one level, it is clearly legal – no laws are being broken, since the drivers have agreed (in some form) to allow this data to be used by Tom-Tom as they see fit. And note – there is no question of information about the behaviour of **individual** drivers being passed on by Tom-Tom. They are very careful to state that all data is aggregated and anonymised before they do anything with it all. So we are talking here purely about the behaviour of **groups of drivers**. So we are definitely not in the territory of breaking any kind of Data Protection laws here. But is there a moral problem with Tom-Tom’s actions? By speeding, an unknown group of drivers are breaking the law. There is no way of knowing who is in that group, nor even where the individuals in that group were coming from or going to, when they were speeding at location x. It seems to me that if we consider a different, but related, situation it wil become clear to us that there really is no moral problem with the police having this data, and using it to decide whether to fit a speed camera at location x. The similar situation I am considering is burglaries in a town. The police find out where, and when burglaries occur because each householder who has been burgled reports their incident. What the police glean from this data is some idea of the number of burglars operating in that town. But if there are 100 burglaries in a year in the town, they are unable to work out from this data whether they have 100 different burglars operating in the town, or whether they have 1 burglar carrying out 100 burglaries in 100 different properties. In that sense the burglary data is identical to the data Tom-Tom provides on speeding drivers – there may be 1000 speeding “incidents” in a year, but this could be due to 1000 different speeding drivers, or one maniac driver who has broken the limit 1000 times in that year! It is probably impossible to tell – depending on exactly how Tom-Tom do the aggregation of the data they receive – and whether they are telling us the full truth or not. Leaving aside our “ifs and buts” here, we can say that the police now have some information on burglary rates, which allows them to decide when and where to step up their policing presence – in the hope of catching this burglar (or burglars) breaking the law. This increased police presence costs money of course, so our bean counters will be most anxious to see that the money is well spent. BUT the important point here is no-one (I hope) would have a moral problem with the police using their information they have gathered on burglaries, and as a result, stepping up their presence in the expectation that they will catch one or more burglars. We are much more likely to say “This is exactly what we expect the police to do, and we wish them luck with the venture”. So, taking the step where we equate lawbreakers Type A (i.e. “burglars”) with lawbreakers Type B (i.e. speeding motorists), I think the obtaining and use of the data is equivalent in both situations, and equally acceptable in both situations. But here at least one other commenter will object. And the objection will go along these lines. Surely the problem is that with burglars, no-one is **selling** any information to anyone. We, the victims, report the crime to the police – free of charge – and the police then act (or don’t act) as they see fit. And with the speeding motorists the situation is entirely different – because here we have a middle man (Tom-Tom) who is gathering the data provided to them free of charge – and then selling this information to the police (via the government). What are Tom-Tom doing here? We know they are gathering data for free – then selling it on in a different format (i.e. aggregated). They are providing a service – to the police – and to us, the motorists. And I think when anyone provides a service, charging for that service is a perfectly normal – and fully accepted practice throughout all developed societies. WHAT? you may say?? How can Tom-Tom be “providing a service” to me a motorist? I am not a victim of those other motorists who break the speed limit, am I? Well, you probably are. Or you may well be at some future date, if you have not been one already. How so? Well, first of all, speeding motorists are a danger to other motorists on the same road. They cause head-on crashes with oncoming traffic when they think they can overtake safely – when they cannot. If you happen to be that “oncoming motorist” – you are definitely a victim. Very likely a dead one. Motorists are also pedestrians and cyclists (particularly in the Netherlands). Speeding motorists are serious hazard to both groups of people for obvious reasons that I shouldn’t need to spell out. So – to conclude. I don’t believe Tom-Tom have done anything either illegal or immoral in charging for the service they provide to governments (and thence to the police) in providing aggregated data on the lawbreaking section of the public. P.S. The above is not the conclusion I wanted to reach when I started writing this comment. I find I have an “emotional” objection to Tom-Tom selling “my data” which I gave them for free. But intellectually, I find that objection without any basis. I operate on the assumption that emotions should not control what I think or what actions I take. I prefer my actions to be based solely on sound reasoning – which I hope I have provided for everyone above. Good points… I would add that TomTom does not only gain traffic data simply from its installed base however they also pay for data from third party organisations (incident data) and GSM cell information from a well known Mobile operator e.g Vodafone… Therefore we should not consider this traffic data as free but as a cost. TT is therefore needing to find licensing opportunities to continue funding this Traffic initiative… Failure to do so would mean that Joe Bloggs will need to be contempt with a free Google maps app which will fall significantly short (in terms of functionality) for real automotive applications. I believe TT screwed up by not controlling the licensed rights for its data but knowing the organisation as I do (ex-employee) I believe they will never allow such negative use of their data. No organisation is perfect however you can tell the quality of an organisation by its remedial actions when they do face such screw ups. But certainly for a UK Tom Tom contract the Data Protection Act will apply. Data may only be used for purposes specified by the data collector, and notified to the DPA registrar, and those purposes must be agreed by the data owner (in this case, the motorist). So if Tom Tom told dirvers their data would be given to the police, OK; if not, they’re committing a criminal offence. Which is doubtless why they backed down pronto. There’s a key difference in your analogy. In the first case (the burglar case), the victim of a burglary supplies data to the police to be used to help them (or those like them), by catching burglars. In the second case (the tomtom case), the driver gives tomtom data to be used (as the driver presumes) to create better estimates of how long drives take (eg iQ routes). While in fact the data is used against them, telling the police where to lie in wait for them. Whether this is morally right or not is a separate question, what is clear is that the data is being used against the provider of the original data, unlike in the burglary example. The primary objective of ALL Police Forces/Services is to ‘prevent loss of life and serious injury’! They use whatever lawful tools they can to do so, and if that means targeting a stretch of road where for reasons of excess speed many accidents occur – they will do so! On the other hand we have Councils, in this Country, who use the same devices the Police use to raise revenue – which causes a problem. The Police cannot refuse to operate them! The use of data, from whatever source, if legally obtained will help to site those cameras/devices where they will be most useful. Those speed limits are set by those you have elected to represent your views (collectively) in the form of a law – it then becomes a duty of the Police. To enforce them. Not too surprised about it being abused in the Nederlands … they seem to have a deep dislike of people travelling faster than what a fit cyclist can achieve, almost as if it’s a personal offense… 60km/h speed limits all over the place on open roads and typically quite low motorway limits (100km/h). Perfect regulatory environment for surveying where people actually feel it safe and appropriate to go a bit quicker (which in a lot of places is used as a method of working out an appropriate limit, not where to enforce an existing arbitrary one!) and then sticking a speed trap in the middle of it to catch the frustrated, misled, or unwary, even though they in all likelihood aren’t actually causing any kind of additional danger. Tahrey is right, just because a state is built below sea level doesn’t mean we should have to drive like we are underwater..